Referring to himself as a "country artist," Xiao Ru-Song embodied sceneries from his hometown with paintings as sophisticated as world-renowned masterpieces to express his love of his homeland. The art classroom is a unique, even legendary, feature of the picturesque Zhudong Senior High. Zhang Ze-Ping, the school’s current art teacher, has named the art classroom "Xiao Ru-Song Memorial Classroom". Walking up the stairs to the second-floor corridor, even from afar, one already has a glimpse of the plaster casts and dried flowers inside the glass windows at the far end as well as the open windows and paintings by Xiao Ru-Song on the building walls in the distance. Xiao used to wake up every morning at five and arrive promptly at school at seven, and had been otherwise known as "the man who wakes up the sun". 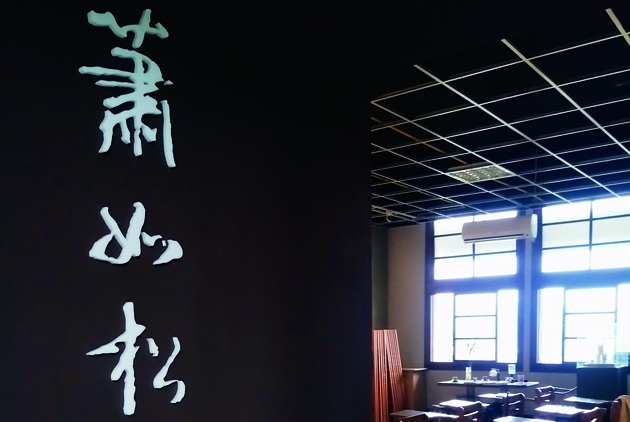 When the alumni of Zhudong High School gather together and reminisce about the past, "Crazy Xiao" or "Boss Xiao" is often a topic that takes center stage. Regardless of which generation the student is from, if they had attended Xiao Ru-Song's art classes, his eccentric ways, meticulousness, firmness, and strictness would have left a deep impression upon, or rather, stunned their minds. The day before or a few hours prior, students would carefully prepare for art class in anticipation of the challenges given to them by Boss Xiao. "Mr. Xiao was always very punctual coming to class. Before class, Mr. Xiao would wait outside the door; as soon as the bell rings he would step inside the classroom, and after the students have entered the classroom, the student at the front would close the door. Latecomers were not allowed inside. Then Mr. Xiao would take attendance", recalled Zhang Ze-Ping, one of Xiao’s students later in his career. "In the first row sat seven 'heads', the second row sat six 'heads'..., the unit Mr. Xiao used for counting was heads, not persons. After taking attendance, he would circle around the classroom. In spring and summer, the sliding windows should be halfway open, while in autumn and winter, there must be enough space for him to place two fingers." After surveying the environment of the entire classroom, Xiao would return to the center of the room and check the students' art equipment to see if these have been laid out according to his "Rules of Art". The little buckets used for rinsing paintbrushes were made from empty KLIM milk powder containers; a length of wire was twined around the opening of the bucket then bent upwards to form a handle. When washing out the paintbrushes, water can't be splashed out, otherwise points were deducted, and rags cannot be new, because materials must be recycled and repurposed. "He would open his portfolio and introduce to us the works of artists from previous generations, guiding us through the exciting parts of these works. In the center of the easel he would place a piece of B4 drawing paper; notes were written on the right-hand side, the left was used for drawing. During pencil sketching classes, Mr. Xiao taught us to draw hands or the scenery outside of the window.” Zhang Ze-Ping remembered that art classes were like military training. Students were required to maintain correct posture, and were not allowed to stretch out their legs even if they became completely immersed in the painting process. "He was so strict he even had rules on the order in which watercolor paints must be placed--black, blue, followed by green, yellow-green, mustard-yellow, crimson, and so on...". Now, Zhang Ze-Ping requests his students to line up before entering the classroom too, as if they were entering a holy sanctum, because he hopes to perpetuate the spirit of Mr. Xiao Ru-Song's art class. The art classroom has become a specially protected area in Zhudong Senior High School, a holy place that beautifies the soul. Not only is it a classroom for students, a small corner also houses an art studio that Xiao had set up. "Hsinchu Senior High School had Principal Xin Zhi-Ping, Zhudong Senior High School had Mr. Xiao Ru-Song." Alumni Zhang Ze-Ping, who has returned and been teaching for ten years, said, "Mr. Xiao's influence on us was really important." Peng Ya-Fang, who teaches art at Zhudong Junior High School and had once also been Xiao’s neighbor, said: "Mr. Xiao was born in Zhudong, and is one of the most iconic figures around here." The verdant greenery brought by the old trees towering all around the campus of Zhudong Senior High School became the best subjects for Xiao's sketches and still lifes. Leading students around the campus to do sketches, he also had rules on where the students should sit and the amount of space between them. Students were also not allowed to leave their seat without a valid reason. While the students were sketching, he would use that time to open his paint box and spread out a canvas to demonstrate sketching for the students. The sketch would be completed five minutes before the class ended so students could observe and learn from it. Throughout his 27 years of teaching at Zhudong Senior High School, in addition to creating a mural for the school hall and designing the school emblem, school flag, and school bell, he also left behind everlasting paintings of campus scenery. 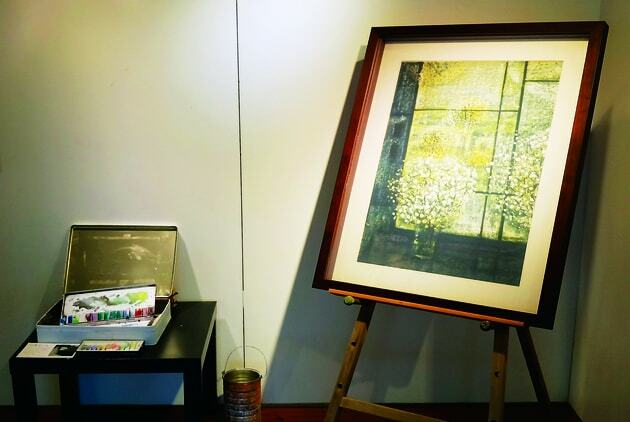 Beneath the woods of the school campus, next to the blooming azaleas, one of Xiao’s paintings, "Garden", has been placed upon a small notice board. Just as the sun shines through the trees, casting light and shadow upon the flowerbed, Xiao used subtle changes of color to depict the scenery of the campus in summer. Pointillist techniques in the Impressionist style were used to portray the leaves and flowers, full of the vibrancy and poetry of life. The light and shadows of the afternoon and the gentle breeze depicted in the painting are just what you might experience upon the campus grounds in real life. During the Japanese colonial era, the grounds upon which Zhudong Senior High School is currently located was formerly a Japanese Shinto shrine with an altar, red doors, and long stairways. Even the most common-looking stairs and flickering shadows among the trees appear to be even more beautiful when depicted by Xiao masterly brushwork. During spring and summer, Xiao would take his homemade "treasure chest" and lead his students around the campus to make sketches. He would use the white newspaper left over from schools exams for his paintings; using calligraphy brushes as paintbrushes, he recorded life with the art of painting. In "Green Shadows", another painting by Xiao, the bicycle shed of the school became a fast-paced modern painting. This was the painting that Xiao entered into the 26th Taiwan Provincial Art Exhibition. Through the simplistic layout, the trees in front of the bicycle shed became as interesting as paper cut-outs. The green shadows on either side of the large tree have the texture of frosted glass, a distinct style created by Xiao. The water break wall made of cobblestone shown in the painting can still be found on the campus of Zhudong Senior High School today. "For something that is truly beautiful, one aspect of it must be consistent with nature, while the other aspect must be consistent with the ideal." German aesthete Egon Schiele said. He Zheng-Guang, publisher of the "Artist" magazine, was one of Xiao’s students from when he taught at Qionglin Junior High School. He says that Xiao's works are easy to understand when viewed from this perspective. "Even though he depicted natural sceneries, the objects and scenes he portrayed were not the appearances of nature, but were simplified and purified expressions engendered by the ideals in his mind; this applies to both form and color. Apart from the school campus and next to windows of the art classroom, Xiao also left behind many landscape paintings near his home, his former residence in Beipu, and the suburbs outside of Zhudong and Hsinchu city and county. "The beauty of the sceneries of my hometown are comparable with the landscapes depicted in world-renowned paintings. Whether or not an artist can become a world-famous master depends on whether the painter has the qualities of a world-class master. If he or she does, then even the landscapes of Zhudong can also become the subject of world-renowned paintings," Xiao Ru-Song had once said. Following his retirement, he held two solo exhibitions at East Gallery in Taipei; the gallery subsequently held a memorial exhibition for Xiao after his decease themed "Sceneries of Hometown", and printed an album of his artworks. "In the long and lonely life of art creation, Xiao Ru-Song loved his hometown with a passion," said Liu Huan-Xian, director of East Gallery. "Through the window of his mind as bright and clear as a mirror, the artist gazed upon the sceneries and objects of his homeland in the distance..."
"Mr. Xiao's favorite sketching locations were the riverbeds of Touqian River from Qionglin to Zhudong, Hengshan, Jiuzantou, Beipu, Emie Lake, and the mountain roads from Zhudong to Baoshan", remembered Xiao’s students; summer dusks just as the sun is setting and afternoons in autumn were also his favorites. "Only when I'm painting do I find happiness, and a place in the world that truly belongs to me", Xiao once said. "Artists must leave behind paintings that are truly good, because this is an expression of love," says the man who humbly refers to himself as "just a country artist". Near Zhudong Senior High School is a cluster of Japanese-style buildings. Xiao Ru-Song once lived for decades down this simple red-brick alleyway. "Come into the alley and you will find many stories awaiting your discovery," say first-time visitors to the Xiao Rusong Art Park. A few cats are playing on the low walls; there is a row of osmanthus bushes within the red brick walls; a small round table sits upon the tatami mat as seen within the wooden window sill, and there are a couple of teacups on the table. Next to this is a study with a cane chair and a rustic desk next to the window. The house is empty except for these simple objects. Inside the courtyard, the trees are laden with green plums; irises bloom in a corner, while sumizome cherry flowers blossom in another. "Ru-Song’s Former Residence" was where Xiao Ru-Song once lived. Throughout his 27 years at Zhudong Senior High School, he had lived in a small house less than 50 square meters that was a part of the school’s faculty residences. He believed that home is where happiness is found, so bad feelings cannot be brought back into the house. He did not tell outsiders about home life, nor did he speak to his family about things that happened at school. Within the low walls was a haven isolated from the outside world. 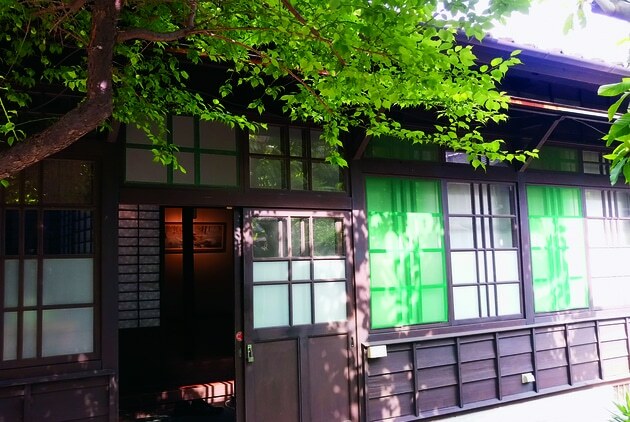 The cement building additionally built on the outside of the Japanese-style wooden house was constructed so that his son could use the toilet with convenience. Inside and outside, the entire home was orderly and spotlessly clean. In the past, when students or colleagues came to look for Xiao, they would shout five times from the outside of the alley, and would go in if there was a response; if there was no movement or sound, they would leave. Xiao Ru-Song used to say, I live in a hovel, but I am content with what I have; before I retire, I will not hold an exhibition. He treated his artworks like they were his children and couldn't bear to sell them. He once wrote down four words on a piece of paper: "As white as paper"; this was his portrayal of himself. In the "Song Hua Lu" Exhibition Hall, there are a few replicas of Xiao's paintings. Even though they are only replicas, one could still experience his unique artistic style. Next to the work "Window Flower" is Xiao Ru-Song's homemade "treasure chest"--a sketch box that he took with him when he went out for sketching. On a cabinet next to the window in a corner of the house, there is a glass vase with dried plants and flowers, a type of scene that often appears in his artworks. In this simply furnished house, one enters the pure, tranquil world embodied in paintings of Xiao without even noticing it.